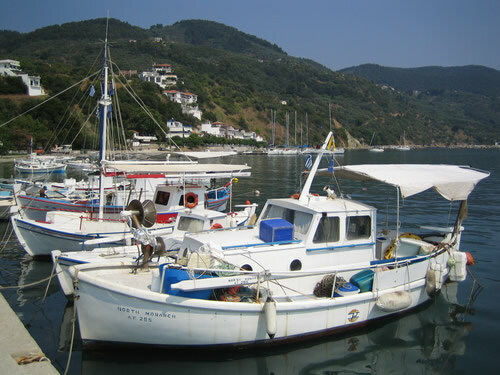 The first reference to Skopelos was around 2800-2000 BC by Thucydides, when it was inhabited by the pre Greek Asia-Minor residents of the Neolithic period. Around 1600 BC it was inhabited by the Cretans ruled by King Stafylos the son of Ariadne and Theseus. The landing took place at a gulf which was named after him as Stafylos cove. The island's capital as the entire island was named after his half brother Peparythos, the son of Ariadne and Dionysus. In the entire island there were four towns: Peparithos, Panormos, Knossa and Selinous. Ancient Peparithos took part in all the wars because it was an Athenian colony. Their regime was Democratic. It had great athletes that participated in the Olympic Games. One of them, named Agnontas, won the racing game in 569 BC and a cove was named after him as an honor; the same name is used even today. During the 13th century BC, King Ilkon of Pella invaded Peparythos stopping any progress until the 6th century when it started exporting olive oil and its famous wine, referred to as an aphrodisiac by Aristotle. The first coin cutting machine named PEPA was placed in Loutraki. Until 338 BC it remained as an ally to Athens but during the battle of Heronia the island was seized by the Macedonians until 146 BC when they destroyed the Fort of Selinous to prevent its use by the Roman conquerors. The presently used name Skopelos ("reef") appears during the 2nd century in Ptolemeos' scripts as a reference to the large number of reefs surrounding the island, causing difficulties to the seamen. As for Glossa ("tongue"), there are two versions for the name: The first version is due to its tongue-like shape of the port and the second that it was given the name Knossa by the seaman and geographer Karyandreas Skylas from Ikaria and it was eventually renamed to Glossa. Finally, Selinous was renamed to Loutraki ("little bath") due to the ancient baths in that area, part of which can still be seen.